Convenient and economical, Hot Dogs are a staple of concession stands, stadiums, convenience stores and more. 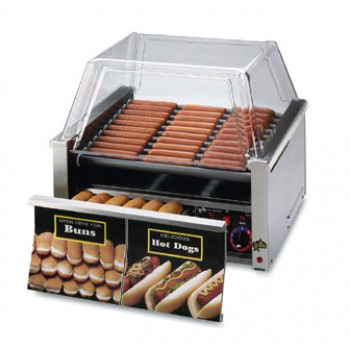 Our selection of hot dog cookers feature capacities ranging from 18 to 230 hot dogs, providing a perfect solution for every operation. When deciding which type of hot dog cooker is best for your needs, determine the volume and method of cooking you prefer - grilling, steaming, or broiling? Hot dog rollers are a perfect option for high-volume service and accommodate a variety of other fast foods including egg rolls, taquitos and more. Hot dog steamers serve a larger volume and keep hot dogs plump and juicy through their steaming process. They also feature built-in bun warmers that keep them warm and fresh until service. 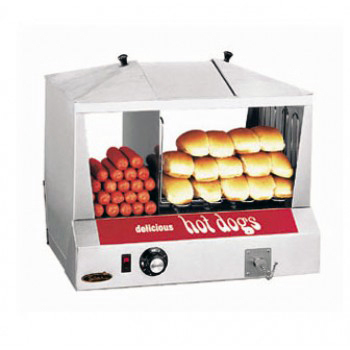 Smaller in capacity but equal in performance, hot dog rotisserie broilers feature either a cradle or spike wheel that rotates to create a perfectly broiled product. 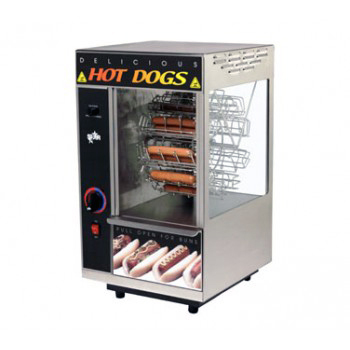 Whichever style of hot dog machine you choose, each provides superior merchandising and quality construction to deliver a profitable and reliable performance.